(Nanowerk News) As hands come in left and right versions that are mirror images of each other, so do the amino acids and sugars within us. But unlike hands, only the left-oriented amino acids and the right-oriented sugars ever make into life as we know it. Scientists know the other varieties exist because when they synthesize these amino acids and sugars in a lab, roughly equal numbers of left- and right-facing arrangements form. But life prefers one. It’s a mysterious phenomenon called "homochirality." Scientists have several theories as to why it occurs. In findings that underscore the role that light may have played in its origin on Earth, a team led by a University of Michigan researcher has shown that the rotational direction of a light beam can coax inorganic nanoparticles to assemble themselves into what amount to left- or right-handed twisting ribbons. Left-handed ribbons twist counterclockwise, and right-handed clockwise. Researchers had previously theorized that a certain type of spiraling starlight could have locked in the chirality, or handedness, of relatively large organic, carbon-based molecules such as amino acids and sugars in living organisms. The starlight would have shone on the cloud of dust and gas that eventually became the Earth. It hasn’t been known until now, though, that light could have a similar and very pronounced effect on tinier, inorganic nanoparticles that aren’t carbon-based. "What we have shown is that nanoparticles of inorganic materials, just like the organic materials like early amino acids, can not only self-assemble, but can do so in a way that exhibits chirality," said Nicholas Kotov, the Joseph B. and Florence V. Cejka Professor of Engineering and a professor of chemical engineering, materials science and engineering and molecular science and engineering at U-M. Kotov is the lead author of a paper on the findings published in the current edition of Nature Materials ("Chiral templating of self-assembling nanostructures by circularly polarized light"). 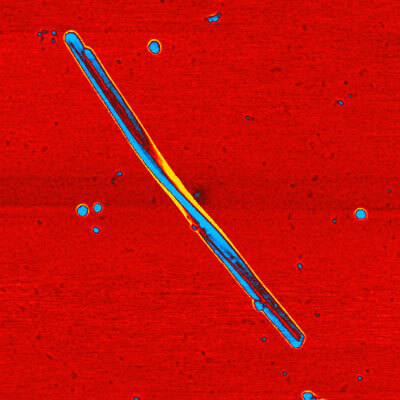 A twisted ribbon of cadmium telluride nanoparticles. University of Michigan engineering researchers have discovered that circularly polarized light can affect the chirality, or handedness, of nanoparticle chains. Their findings could provide insights into the structure of life. Kotov and his colleagues shined circularly polarized light on particles of cadmium telluride in a solution. Light has both electric and magnetic components and its polarization refers to the orientation of the waves of each component. In circularly polarized light, the electric field rotates around the magnetic component. Circularly polarized light is believed to be rare in the natural world, though it may not have been at an earlier time in the universe. In the experiments, the researchers exposed one group of nanoparticles to left-handed circularly polarized light, which rotated counterclockwise. They exposed the other to right-handed polarized, or clockwise rotating, light. In each group, roughly 30 percent more of the nanoribbons carried the chirality of the light they were exposed to. That percentage is ten times higher than researchers have found that circularly polarized light effects larger groups of molecules, Kotov said. The nanoparticles in both groups started out with mixed chirality. Some particles are left-handed and others right-handed. The researchers theorize that the ones with a chirality that matches the light shining on them react with that light in ways that cause them to grow, or attract more molecules. When the light rotation matches the particles’ handedness, chemical reactions are able to occur, including oxidation, or loss of electrons. That electron loss puts charged nanoparticles in the mix, and those can react with other nanoparticles in ways that favor more of the same. "The chirality accumulates," Kotov said. While Kotov says the first living organisms were likely microscale, he’s quick to point out that the work doesn’t say nanoparticle ribbons of any sort are precursors to life. "We don’t know yet how the organic molecules and inorganic nanoparticles interacted," Kotov said, "or how chirality evolved to become left for amino acids and on right for sugars. But we think the answers should involve consideration of not just organic matter but this additional player of inorganic nanoparticles, which is actually quite significant." Beyond any insights into the structure of life, the research could also show a new and cheaper way to engineer molecules that face left or right. Current methods of inducing chirality, as this process is called, are difficult and expensive, yet they have applications in making things like pharmaceuticals, wearable or implanted sensors, telecommunications and display technologies. Chiral nanostructures can help double the informational bandwidth of these devices using left and right polarized light.